I am brimming with excitement today. Here are the reasons why: 1- This is the best cake I have ever made and I can’t wait to share the recipe with you. 2- I leave today for San Francisco! Woohoo! And you know what is waiting for me there? A weekend of fun including the Food Buzz festival and getting to visit Andy’s hometown. Yup- I’m a happy girl. Remember the first time I tried to make a layer cake? Yeah it didn’t turn out that well. This one was much different! Now I know that my layers aren’t exactly even, and I think I know how to fix it for next time, but is it so bad if I actually kinda like them this way? Sometimes I think a little less than perfect can be the most beautiful. Guys I must say that this is one amazing cake. The frosting you may have seen before. Remember these cupcakes? When I made them back in May I used it on a Coconut Vanilla Bean Cupcake. Now even though they were outstanding, I had bookmarked this pumpkin cake recipe it was originally paired with for sometime in the fall. The frosting comes together like so: make caramel sauce, add cube by cube of cream cheese until the frosting is silky and caramel-y and delicious. Chill for a few hours so it gets nice and spreadable- and there you go. Pair it with the most soft and fluffy pumpkin cake, cinnamon sugar pecans and a drizzle of caramel sauce, and this is a fall dessert at it’s best. Trust me! In a medium saucepan, combine the sugar and water. Cook over high heat, stirring, until the sugar is dissolved. Using a wet pastry brush, wash down any crystals from the side of the pan. Cook over moderate heat without stirring until a medium-dark amber caramel forms, about 9 minutes. Remove from the heat and immediately stir in the butter and heavy cream. (Don't worry if the butter separates.) Stir in Vanilla extract. Transfer the caramel to the large bowl and using an electric mixer, beat at low speed until the caramel cools slightly and comes together, about 5 minutes. With the mixer on, beat in the cream cheese, 1 cube at a time and beating well between additions, until silky. Transfer the frosting to a bowl and refrigerate until very firm, at least 6 hours. Preheat the oven to 350°. Butter and flour two 8-inch round cake pans. In a medium bowl, whisk the flour with the baking powder, salt, cinnamon, ginger, baking soda, nutmeg and cloves. In a bowl, using an electric mixer, beat the brown sugar and eggs at medium-high speed until fluffy, 3 minutes. Beat in the oil, then beat in the pumpkin puree. Alternately add the dry ingredients and the milk in 3 batches, beating well between additions. Pour the batter into the prepared pans and smooth the tops. Bake for 40 to 45 minutes, until a toothpick inserted in the center of the cake comes out clean. Let the cakes cool on a rack for 20 minutes. Run a knife around the edges to loosen the cakes, then invert them onto a wire rack to cool completely. Using a serrated knife, carefully slice each layer of cake in half to make 4 thin cake layers. Place one layer on a plate and spread with 1 cup of the caramel–cream cheese frosting. Top with the the next 3 layers and repeat. Then, frost the top and side. 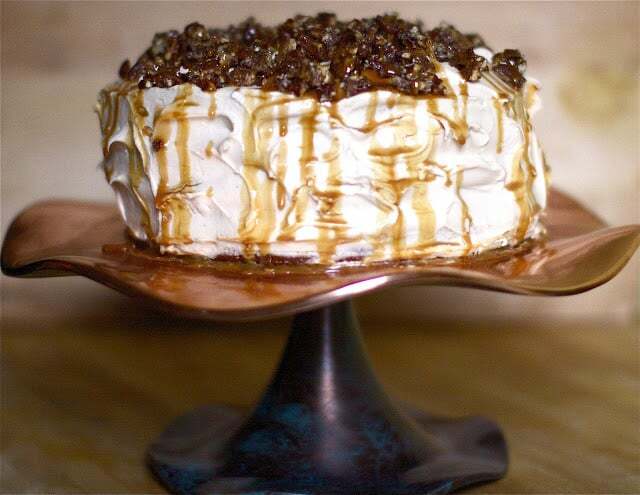 Top with Candied pecans and Caramel Sauce (optional) Refrigerate the cake for 2 hours before serving. Preheat oven to 350°F. Combine sugar, cinnamon and salt. Whisk egg white until frothy and discard about half. Add the nuts. Toss until well coated. Add dry ingredients and stir well. Spread nuts on a cookie sheet lined with foil, in a single layer. Once cool- break the pecans apart and sprinkle on top of the cake. *The cake can be refrigerated in an airtight container for up to 2 days. Serve cold or at room temperature. Audra-how wonderful this giveaway is and yes I one that wished for the cake stand! I completely understand the issues you have had with layer cakes and I definitely need to get more practice. Your cake here looks amazing and I have printed the recipe. Love the pumpkin caramel flavor combo. What would I put on the cake plate…it would have to be a perfectly layered and tasty birthday cake for my husband! Wow, this looks absolutely wonderful! I tip my hat to you! This cake is absolutely beautiful. So funny, I saw the pic of the cake stand and was wondering where I could find it, then I read about the giveaway. Exciting!! Since I have a cake stand obsession, I would add it to my collection, but I would proudly display some pumpkin cupcakes on it. What an unusual and beautiful cake stand. I think my chocolate layer cake topped with ganache and gold shimmer sugar would look amazing on it! Can’t wait to make this! My cakes never look perfect, but displayed on a cake plate as this, they would all look amazing. It is a gorgeous stand! Gorgeous cake stand and cake! It’s beautiful and I would love to make it. If I won that plate your cake here is exactly what I would put on it! This might be on my Thanksgiving dessert table this year. Thanks for the great photos and recipe. If I won the cake stand I would bake my pumpkin cake with gingerbread frosting and showcase it on that gorgeous stand!!! I am a Facebook fan!!!! And your cake looks amazing. I am definitely going to be making it before the end of the year!!!!! Thanks for this great cake! This cake is simply to die for. I actually love the uneven layers because it makes it that much more appealing. Wow. I follow you on twitter, but I just liked you on Facebook (I have to figure out how to make a page). GREAT giveaway. I’m not sure what I would make first. Perhaps this cake or even a cheesecake. What an amazing cake!! And a great giveaway. I don’t make nearly enough but I would have to come up with something extra special to put on that cake stand. I’m thinking a caramel apple cake, since you’ve already covered pumpkin. I would definitely put my famous Carrot Cake on the Copper Canyon Cake Stand…plus the alliteration is to hard not to love itself. My little sister’s 16th birthday is coming up soon. I would use the cakestand as the centerpiece for her birthday table. with a beautiful cake on it of course! Beautiful cake and awesome cake stand. I would probably put some cupcakes on it because I don’t make cake often. I much prefer cupcakes! This sounds so yummy! I’d put a big NY Cheesecake on that stand. I’m craving cheesecake like mad. Oh my gosh this cake looks awesome!! i’m drooling! If I won the stand I would try to attmept this cake! Your cake looks GORGEOUS, and I don’t think “imperfect” layers make it look any less delicious (MORE delicious, if anything, since it shows it was homemade). I would put Christmas cake on the cake stand–it’s an angel food cake with raspberry jam and whipped cream that we made for Christmas breakfast every year. 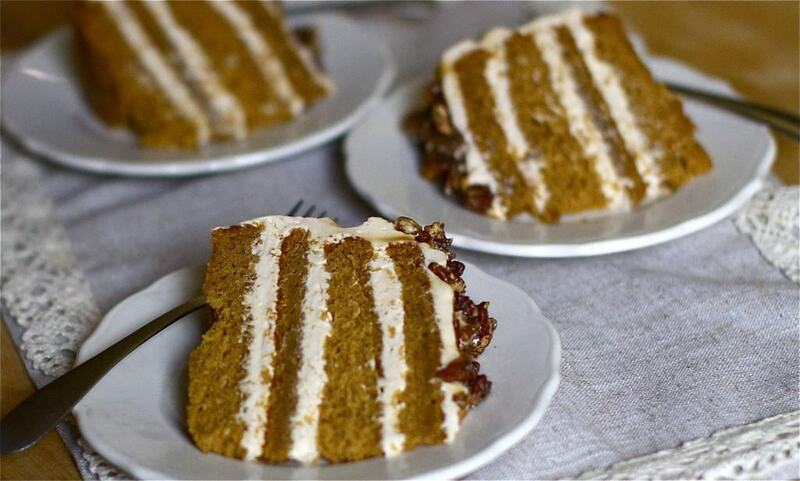 I’d put my “famous” triple layer carrot cake on it–perfect for Fall! O.M.Goodness this looks amazing. If I won the stand, I’d have to inaugurate it with this very recipe! You never cease to amaze me, Audra. That cake stand is pretty spectacular. Of course, a cake stand is nothing without a beautiful cake like yours. It’s very Potter-esque to me. I think I have to top it with some cauldron cakes for sure. That is one gorgeous cake! Nice work. I’d put my lemon cream cake on that stand. Hey and have fun at FBZ! OKKK cool cake stand and I would make a cinnamon poppyseed cake. so good! and so excited. I would display this cake, which looks amazing! I would make this cake. I would use the cake stand to display my favorite dessert, Creamy Ricotta PineNut Torte! Gorgeous! Can’t wait to see your tweets! You are added to my Twitter feed!!! I would definitely love to put a big delicious cake on here! Maybe even this pumpkin one since I am loving pumpkin lately! Or maybe a chocolate gingerbread one… or something seasonal like that! Lovely cake, as always, like with your other dessert creations! :) I am definitely going to try out this recipe at some point. As for what I would put on top of a Copper Canyon Cake Stand if I won, a Tiramisu cake! The cake stand and cake are beautiful! I would have to say some kind of pumpkin cake, I just love the fall spices!! I would LOVE to win the cake stand and can think of many things to display on it, including the Pumpkin Caramel Layer Cake that I will be making shortly :) Also, my famous Giant Cupcake (made with an awesome cake mold) would love great on the stand! This cake is beautiful. If I won the cake stand, I would make a banana cake with peanut butter frosting. I’m really craving banana cake right now! This sounds delicious! I would display a pumpkin roulade that I have been dying to make this fall! I am your fan on Facebook as well. I think that cake looks pretty amazing on the stand. My favorite though is a double dark chocolate. What a beautiful piece of art! A cake for my Mom for her birthday on December 6th! OMG! This cake looks divine!! I can’t believe how you keep making my mouth water post after post, the pumpkin pie cupcakes are such a huge hit in my social circle… I made them three times in October! Can’t wait to try this cake, I’d happily display it on that gorgeous cake stand if I won! I think a 8 layer coconut cake would look marvelous on this cake stand. This is a beautiful stand. I would try to make this cake. I would love it for Thanksgiving (or any day really). Thanks for the wonderful recipes! I now follow you on Twitter! Yay! Oh, I remember! The cake stand is stunning! As for what I’d display….I’d make that cranberry up-side down cake I’ve been wanting to make. Like the stand – perfect for the season! Thanks for the giveaway and have a GREAT time in San Francisco! I already follow you on twitter! I “like” you Facebook page! That would be a beautiful place to display birthday cakes! This cake stand is so elegant! And this cake looks perfect on the stand. Can not wait to make this for Thanksgiving!! Beautiful cake stand, the first cake I would grace it with if I win is Carrot Cake. That cake is beautiful and would be perfect for Thanksgiving. Can I use a cake stand for a pie? I’m going to try a cranberry apple walnut pie for the holidays and if it turns out the way I want it to, I want it shown off with style! I would use it to display my daughter’s bday cake. LOL I totally saw this cake stand with the cake and copy and pasted the cake recipe from the Nambe website just yesterday. I love Nambe and I love the Pumpkin Cake it is fantasty delicious!!! I would display almost anything sweet on such a beautiful cake plate! Triple layer German chocolate cake with pecan frosting. What an exciting giveaway!! I’d display the pumpkin butter cake I’m planning on making around thanksgiving! LOVE the colors of this stand! This cake looks delicious:) and the frosting sounds amazing! As for the cake stand, I would def make your pumpkin caramel cake for thanksgiving, its beautiful and sounds tasty and is perfectly themed for the holidays! I’m planning to make an Autumn Delight Cake which would look great on this stand! That gorgeous cake stand can certainly hold a Red Velvet Cheesecake smothered in a velvety smooth cream cheese frosting. This recipe looks SOOO good! I would make a caramel apple cheesecake and display it on this stand…the colors would go perfectly together! Great way to display a fall dessert! This cake sounds absolutely delicious! I am going to have to bookmark it for sure! I would display just about anything on this! Cookies, bars, my birthday cake (only a couple months away). So pretty! What a beautiful cake stand (and a luscious looking cake). I would love to make your Peanut Butter-Chocolate Tart with Pretzel Crust to go on this. I’ve been wanting to make it for a while and I think it would look fabulous on this stand! I also like you on Facebook. I would love to put a pumpkin pie on the cake stand for Thanksgiving! Hey there — just saw your news on Twitter :) Congrats! Well the possibilities are endless but I’d have to display a black forest cheesecake I’ve been dying to share with everyone. Would look awesome on this cake stand. Have fun at the festival. So jealous, wish I could go. I’d display a delicious red velvet cake. My favorite! I love the cake and especially the cake stand! I have gone through almost your entire website printing out recipes for parties and things and not one has turned out wrong. If I won the cake plate I would use it to display my friends birthday cakes and the tasty recipes from your site! This cake looks unbelievably delicious! I am bookmarking it to make soon. Congrats on being in FoodBuzz Top 9, and have so much fun at the conference. I’d love to win this cake stand. My husband’s 30th birthday is coming up in December (!!! ), and I’d like to display his favorite cake (shadow layer) on it! I am now following you on Twitter – and see that you are engaged!! Congratulations!!!! Love this recipe!!! OMG! and I am definitely following you! If I won this beautiful cake stand, I would display my Chocolate Hazelnut Cake on it! THIS is a showstopper cake! It’s Beautiful and looks so good!!! After work tomorrow, I am diving into baking this cake – cannot wait! This cake stand doesn’t want to be stored away in the cupboard. It will prominently display my sweet treats along with the colorful fruits & veggies I purchase weekly at our local farmers market! That is one amazing cake – well done and thank you for sharing it! Beautiful cake, fabulous cake stand! I’d use that cake stand for displaying my hubby’s favorite strawberry cake in the summer and in the fall, a nice, spicy apple bundt cake. Thanks for the recipe and the nice giveaway! I’d put a seven-layer rainbow cake on this stand, in celebration of PRIDE! I have a small at home baking business. I am doing a bridal show in January. I would LOVE to have this on the table to display edible favors. I can think of thousands of times that I would reach for it. I would put my Mom’s pound cake on it! It is our family favorite and how we still have her with us at every holiday! I have now figured out the right time to open the oven door to make it fall just right! She used to HATE when we intentionally made it fall, but it makes it SO much better! LOL! Such a stunning cake–and stand! I would be proud to display my homemade chocolates on it for the holidays. It would truly be a wealth of riches! I would put pound cake on it! I love the cake stand. Gorgeous! I’d make something simple to show off the beautiful cake stand – like a flourless chocolate cake with a light dusting of powdered sugar. Gasp….Your recipe looks positively AMAZING…and I pushed the “bookmark” key with unbridled gusto!! The only OTHER cake I would deem worthy of the gorgeous cake stand is my own “signature” cake (according to family and friends)..CASHEW MERINGUE TORTE w/CHOCOLATE GANACHE..for its “show-stopper” factor (she tried to say humbly, yet failed). This cake stand is truly a piece of art. I would serve dessert on it every Friday night to my family and friends. It would make any dessert look beautiful but I think my triple layer chocolate marble cake would look amazing on it. When it isn’t being used for dessert I would keep it on my kitchen counter displaying fruit, like the beautiful pears that are in season right now. It would also make a pyramid of apples look gorgeous against the copper colour. I love it! Love Nambe, don’t have a cake stand because I never found one that wasn’t plain and boring, will buy this one if I don’t win it and will grace it with your beautiful cake! I have been looking for a fall cake, and I think this is it! Beautiful! I have a 4 layer White Chocolate Mint Cake sprinkled with Green Jimmy’s that I would love to display on that beautiful cake stand. It was a cake that I had baked only one time for my son’s birthday and have been meaning to recreate it for his 17th birthday. Love the cake stand. I would totally make the Pumpkin Caramel cake because I love love anything caramel and this cake is totally calling my name. This would be great on the Thanksgiving table! I liked you on facebook. oh my goodness, that cake looks SO delicious! i’d love to try to make that pumpkin caramel cake and put it on the stand (perfect timing for Thanksgiving too)! I’m cooking & freezing LOTS of fresh pumpkin these days and can’t wait to try your delicious cake! However, I have an amazing dark chocolate layer cake that would look perfect on that cake stand…. Love the recipe and the cake stand. I would use the stand for weekend coffee cakes. Thanks for the excellent posts! I think that cake looks amazing, uneven layers and all! have fun at the Food Buzz festival! As a Thanksgiving Day baby about to turn 50, I was “shopping” for a new pumpkin cake recipe to celebrate the event with my family. During a search I saw this delicious looking cake on a beautiful and artistic cake stand. Being an artist myself, I thought “what a wonderful pair”. For the past several years I have made a vegan, triple layer pumpkin cake with penuche frosting for my birthday, this year, I think I’ll make your pumpkin cake. As for the giveaway of the cake stand, since I will be celebrating my 50th on the 23rd this year, I’d top it with a pumpkin “birthday” cake (your recipe) and rejoice at the gathering of my family. Thanks for sharing your creative genius. Happy Thanksgiving too. Your recipe sounds amazing! And I would love this cake stand; I would make a pumpkin cheesecake (that I’ve been craving recently…) or attempt to make a layer cake like yours! Have fun in SF! oh wow that cake stand is beautiful and so is your pumpkin cake! I would display a chocolate 4 layer chocolate Heath Bar cake! I liked you on facebook! I am following you on twitter too! I love you blog! That is one delicious looking cake. I would totally make a cake to display on that cake stand. I now follow you on Twitter @GoddessFoodie. I’d make THIS very cake and put it on the cake stand. Actually I’d BEG you to make me the cake, and I’d eat it, with my hands (I’m not a very classy girl), right off the cake stand. WOW! it looks to die for good!!!! A tall carrot cake would look beautiful on this. Ooooh, love the cake and the cake stand. I think if I won the stand I’d have to make the cake to go on it – they look fabulous together! I will make this cake and display it on the stand! i’m making this cake for sure!! I would make Mile-high lemon coconut cheesecake to display on the stand. That cake looks yummy!!! I would make a coconut cake on it first. I would have to display a cake! Your cake looks wonderful! We always have angel food cake for birthdays, with drippy chocolate on top, so that is what I would have to display on the gorgeous cake stand. thanks for the opportunity to win it, have a great weekend! I found this yummy looking cake and had to stop and see what it was. Needless to say, this is on my list to make this holiday season. I too have a little bit of trouble with the layered cakes, but this one sounds too yummy to pass up. If I were to win the cake plate, I’d display this cake on the cake stand. The cake stand is beautiful and would love to have it. Thanks for posting the recipe. Oh wow! This sounds amazing and it is a beauty! Pumpkin and caramel together is divine! I would definately display a delicious fall cake featuring apples or pumpkin on the cake stand! I am now following you on Facebook. This recipe looks amazing! This is definitely going on my ‘recipes to try’ list! I collect unusual pedestal cake plates and I would love this one to add to my collection! It would would look wonderful at Thanksgiving displayed on my grandmother’s antique sideboard topped by an Apple Pound Cake with Caramel Glaze. This cake looks beyond amazing! So excited to make it! This would be the first thing I would display on the cake stand for sure! I would definitely make that cake to display on that fabulous cake stand. Gorgeous! This cake is beautiful! I will be making this soon as I love anything with pumpkin…the cake plate is awesome and hope it comes to live with me….. I “like” you on facebook now….. I am following you on twitter @rusthawk. Thanks for the chance to win! I would put the gorgeous Pumpkin Cheesecake my hubby makes on it! I would have to make a German Chocolate Cake for my husband. It is such a beautiful cake stand! I just found your site. I like this. And I love the cake stand. I don’t even own one and I bake all the time. I think I would put on that stand a chocolte indulgence cake of some sort to reflect the bronze. 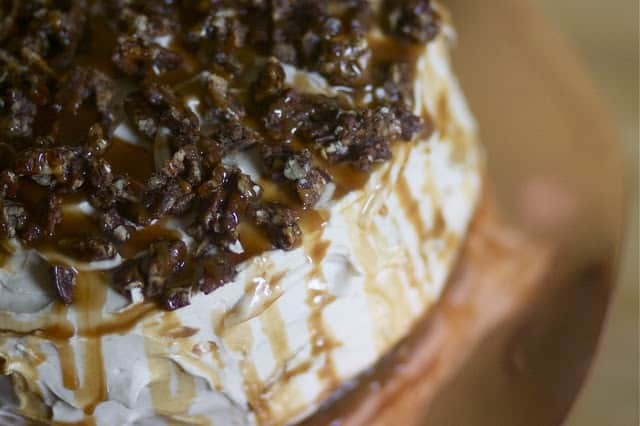 The cake would have pecans, fudge, and caramel dripping from its sides. Or else I would put A pumkin swirled cheesecake on it. Sprinkled with nuts and caramel. I’m just on a caramel kick. Great giveaway! I’m always baking so I have no idea what I’d use it for first…although I’m due for some kind of chocolate cake. That is a gorgeous cake stand and the cake is one I’m attempting for our thanksgiving (as a Brit married to an American). If I had that stand, I would use it to display the strawberries, cream and summer fruit sponge layer cake my husband wants for his 30th birthday! Thanks for the lovely recipes. PS. Following you on facebook now. Oh man, what wouldn’t I put on that stunning cake stand! I’d start with some thanksgiving pies, but I think it would look lovely even with just some fruits on it. Oh my gosh this looks so good! I love pumpkin and caramel. Drool!!! This looks incredible!! I love all of your recipes so much. If I won the cake stand, I would make & display my grandmother’s famous carrot cake! It is my grandfather’s absolute favorite, and his birthday is the day before Thanksgiving. I ‘like’ you on Facebook! If I won this dessert platter I would use it at my wedding reception (in march) for one of the desserts we are serving! Oh my goodness! I would LOVE to make this cake and display it on that cake stand. What a fabulous pair. P.S. CONGRATULATIONS on your engagement!!!! I’m a Facebook fan too! I would love to use the cake stand for pumpkin cheesecake! I also follow you on twitter. wow…what an incredible cake! forget the stand I want the cake! I made this for my birthday cake, and it was AMAZING!!!!!! Some of the pecans started to burn after about 15 minutes, but everything else was perfect. Thank you! Can this cake be frozen? Hey! I think the individual layers could be frozen until ready to frost. Good luck! with a quick heads up! Apart from that, great blog! I know you posted this some time ago, but I have a question. Did you by any chance make extra frosting? The original Food and Wine recipe has only two layers spread with 1 cup of frosting in the middle. I noticed you also used 1 cup between layers, but you have four layers. Can you confirm that the frosting recipe you use here is enough for four layers? Thank you!